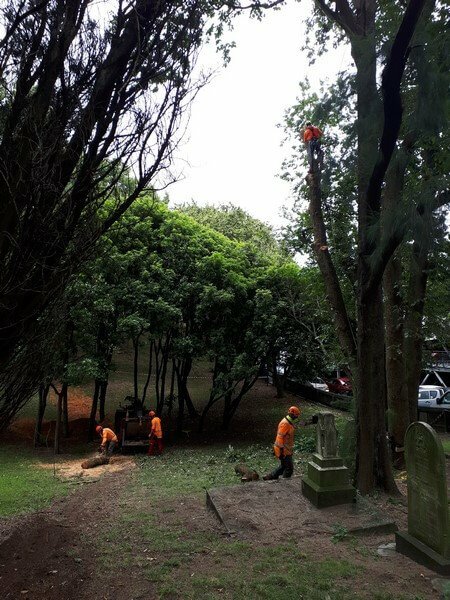 Elm Tree Removal Case Study – Pro Climb / Tree Care Auckland was recently called in to assist on the removal of some English Elm trees at Symonds Street cemetery in the centre of Auckland. Symonds Street cemetery was the first official cemetery in Auckland and dates to 1842. 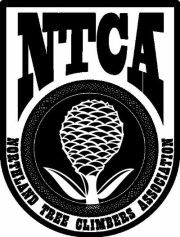 It has a Historic Place – Category I listing with the New Zealand Historic Places Trust. It has nearly 6 acres of deciduous forest, some of which is comprised of Elm trees. Many Elm trees are showing signs of Dutch Elm infection which has killed large portions of their canopies and in some cases killed entire trees. To halt the spread of infection, it was decided to remove the infected trees and create an Elm free barrier between the areas that had been affected and those that were showing no signs of infection. 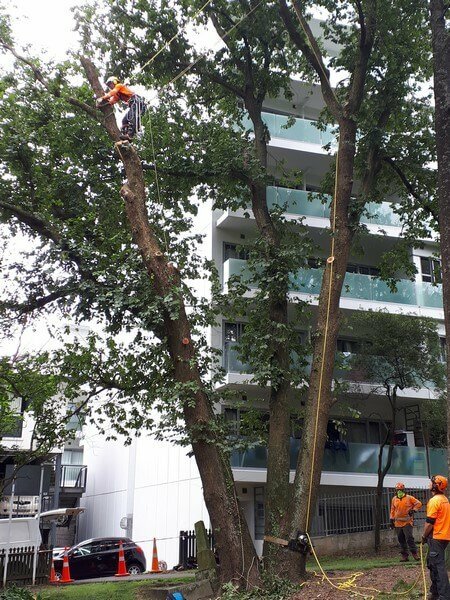 Due to the location and the presence of the trees the Elm tree removal had several challenges that needed to be addressed to create a successful outcome. To date no country has ever managed to eradicate Dutch Elm disease once it has been introduced. Dutch Elm disease was first identified in Holland in 1921 (hence its name) but is thought to originate from other parts of the world. It was accidentally spread to Europe and America where it wiped out large numbers of Elm trees. It was first found in Auckland in 1990. The disease itself is a fungus that is spread by a beetle. The beetle burrows in underneath the bark of Elm trees to lay its eggs which hatch into larvae. The fungus “rides on the back” of the beetle to get any easy entry into the tree where it can then feed on the tree. This seriously affects the trees health and, in many cases, leads to the death of the tree. The disease can also spread via root contact from infected trees to uninfected trees, and by the movement of infected tree parts (firewood, branches, etc). Control methods have involved using pheromone traps to capture the bark beetles, removal of infected trees, and tight controls on the movement of infected tree parts. As we were working on infected Elm trees it was important we took measures for health and safety. This was to ensure that we did not become vectors for the disease ourselves and infect otherwise healthy trees in different locations. To do this we treated all our equipment and PPE with Trigene disinfectant at the end of each day. During the duration of the Elm tree removal job took a few weeks. 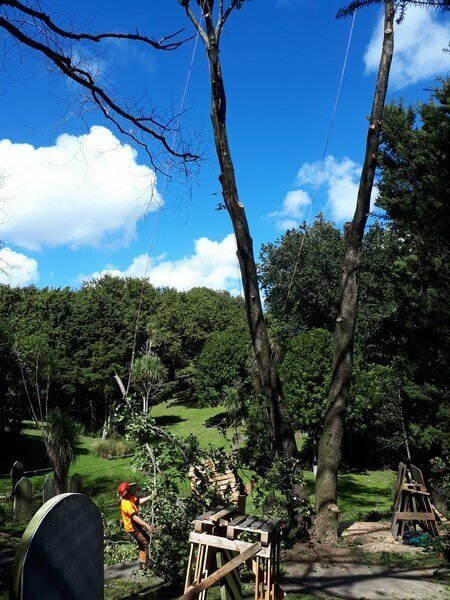 The tools and equipment that we used for this Elm tree removal job were kept separate from those of our other crews to limit the chance of cross contamination. One of the main challenges we faced were the 150+ year old grave stones beneath the trees. The material of the gravestones has not aged well, and they are incredibly fragile. Large pieces of timber and sentimental ornaments with the structural integrity of a sand castle are not a good mix. Repairing any damage would either be impossible or very difficult so we took no chances. Wooden structures were built around the higher risk grave stones and we used rigging techniques to safely control each section of tree to the ground. The GRCS equipment played a large part in making the Elm tree removal run smoothly and efficiently. One tool that came in very handy was the GRCS or Good Rigging Control System. This is a lowering device combined with a winch that you would normally find on a yacht. This device enables us to make a crane out of the tree, so we can lift and manoeuvre branches with greater ease to where we need them. All the debris had to remain on site to limit the spread of infection. To make this possible a tracked chipper was brought in by Treescape (http://www.treescape.co.nz/) who were the principal contractor. The chipper could be brought right next to the piles of branches and wood which were then chipped and left on site to decompose. At the end of the job the protective wooden structures were removed, and all the gravestones were still in their original condition which was a big relief. The cemetery has less Elm trees than it did, however, we hope that the remaining Elms will now have a better chance.